As the flooding from Hurricane Florence dissipates, North Carolina residents could face significant public-health and environmental crisis after at least 17 animal waste pits, coal ash facilities, and human sewage plants across the state released millions of gallons of toxic liquid into nearby communities. 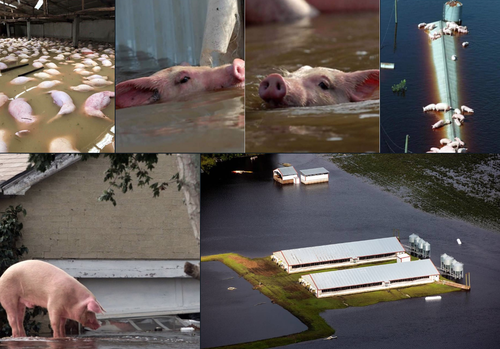 On an aerial tour Monday of pig country, housing the nation's largest hog producing counties, many anaerobic lagoons or manure lagoons, a human-made outdoor earthen basin filled with animal waste, survived the devastating hurricane, but some were badly damaged with breaches flowing into local water systems, said Bloomberg. Five days after Hurricane Florence made landfall, much of North Carolina's low-lying eastern region remains flooded and effectively shut down. Bloomberg estimates the damage from the storm is north of $22 billion, a Keynesian dream for the Trump administration to spend, spend, spend. About 2,200 people and 578 animals have been rescued in North Carolina and about 10,000 people were in shelters. Almost 322,000 homes and businesses were without electricity in North Carolina, South Carolina and Virginia. Sixteen rivers reached major flooding stage, with three others expected to peak in the next two days, Governor Roy Cooper said. "Sunshine doesn’t necessarily mean safety." New Hanover County and Wilmington, which are mostly cut off, opened distribution centers for meals, water and tarps to supply 60,000 people for four days. Daniel Andersen, an Iowa State University assistant professor who studies manure management, told Bloomberg that pigs produce three to four times more waste than a human per day. Farms then pump the waste into lined earthen pits, sprayed with bacteria to break it down, then recycled on fields as fertilizer. The state has more than 3,000 waste lagoons, according to the Department of Environmental Quality. Megan Thorpe, a spokeswoman for the state’s Department of Environmental Quality, said there had been two confirmed waste lagoon breaches, including a Duplin County site that contains more than 300,000 cubic feet of waste. According to other state officials, two more waste lagoons had structural damage. Thirteen had discharges, nine were completely flooded and 55 others were near overflowing -- an environmental disaster that could have severe consequences for surrounding communities. 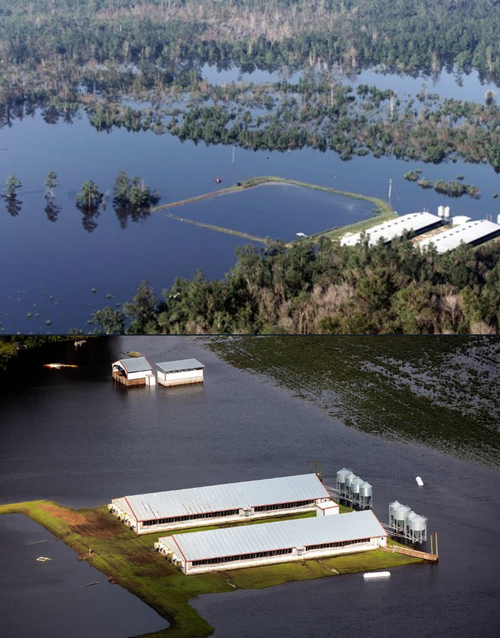 The North Carolina Pork Council said most waste lagoons escaped Florence's wrath. "While there are more than 3,000 active lagoons in the state that have been unaffected by the storm, we remain concerned about the potential impact of these record-shattering floods," the council said in a statement on Monday. Rumpler told Bloomberg that pig waste contains E. coli and bacteria. Sewage overflows, combined with floodwaters is the makings of an ecological disaster. Humans coming in contact with the contaminated water could face life-threatening infections. “There are a lot of potentially nasty pathogens,” said Tara Smith, a professor of epidemiology at Kent State University in Ohio. North Carolina utility companies reported that millions of gallons of human sewage and grey water from wastewater plants poured into lakes, streams and city streets after more than 40 inches of rain were dumped onto the region. In Wilmington, the Cape Fear Public Utility Authority said more than 5 million gallons of wastewater discharged into the Cape Fear River after generators failed. It was the most significant release in the company's history, said Executive Director Jim Flechtner. In Jacksonville, the Onslow Water and Sewer Authority experienced a “catastrophic failure” and completely depressurized, according to the EPA. Reggie Cheatham, the EPA’s director of the Office of Emergency Management, said wastewater was pouring out of utility holes and treatment plants. Nathan Gardner-Andrews of the National Association of Clean Water Agencies said little could be done to prevent such failures because "there is not really a sewer on the planet that is designed to handle this level of rain." He warned that the hog lagoon breaches are of much concern. "The waste just sits there,” he said. “It’s not treated in any form. We are talking about hundreds of thousands of pigs."